Given the importance of collections for mammal research, the Systematic Collections Committee was created to advise institutions on their management, preservation and other related topics. Its goal is to ensure that specimens are kept in the best possible conditions for future research. To develop a standardized policy for all mammal collections in Argentina. To stimulate and support funding for the permanent growth of mammal collections. 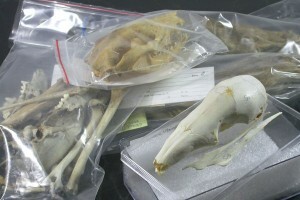 To estimulate the exchange of information between institutions, researchers and students regarding mammal specimens. To promote field trips to increase the number of specimens represented in Argentine collections, including all mammal taxa, taking care not to damage the status of endangered species. To define a standardized policy on the use of mammal collections according to state-of-the-art techniques and methods. This Committee will be presided by a responsible member who will be in direct communication with SAREM’s standing Board and an assistant member from the same Province. Both members will incorporate collaborators from different Provinces and countries to optimize the exchange of information. This committee advises on collection management and specimen preservation. Each year, the committee compiles information on the materials and their status for each Argentine collection. This information is available to all SAREM members. These documents are filed for future use and copies are sent to the SAREM’s Directive Board. Analyze and describe the current status of each Argentine mammals collection, including their location, types of material preserved, and needs. Pablo Teta (coordinator), Guillermo H. Cassini, J. Benjamín Bender y Gabriel Martin.